Tour times are subject to change. Tours are offered daily unless noted otherwise. Please call (617) 357-8300 for information on future tours' dates and times. TIP: Tour attendance typically is lighter later in the day! Freedom Trail Foundation-led tours are schedule 362 days per year. Please review the Foundation's tours and tentative year-round tours schedule. Freedom Trail official historic sites are closed and Foundation-led tours are suspended on Thanksgiving Day, Christmas Day, and New Year's Day. *Boston Town Crier Tours - Endorsed by the Freedom Trail Foundation, however Foundation-led tour tickets are not valid to use on Boston Town Crier-led tours. Freedom Trail Foundation-led tours depart from the Boston Common Visitor Information Center or ArtsBoston Booth at Faneuil Hall and are 90-minutes in length. Public tour admission prices do not include entry into select Freedom Trail sites, including Old South Meeting House, Old State House, Paul Revere House, and Old North Church. Walk Into History Tours highlights the revolutionary history that took place at 11 of the 16 Freedom Trail sites between Boston Common and Faneuil Hall; tours begin and end at either location. North End Tours highlights the revolutionary history that took place at 4 of the 16 Freedom Trail sites as well as other North End points of interest between Faneuil Hall and Copp's Hill Burying Ground. 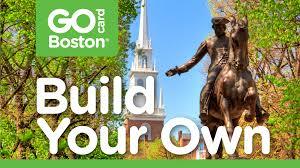 Discount tickets are limited to 10 people per tour (including GoBoston card holders). For groups larger than 10 people, please call (617) 357-8300 for reservations assistance.